43′ Baia – Bing Bang for the money! With her open concept and modern style the 43 Baia is a great choice when choosing a yacht charter. Boat rentals in Miami are a great way to explore South Beach and other surrounding areas. The 43 Baia has a large open terrace with comfortable sun pads. The cockpit is large, featuring a dining area, sofa, and a wet bar. This boat is great for those who enjoy swimming and diving due to its easy access to the water. It easily accommodates 12 passengers for a fun time out on the water on a day charter. Learn more about this boat rental below or check out our other Miami Boat Charters. For those who are interested in an overnight stay, she offers one stateroom with a queen size bed and ensuite head with shower. 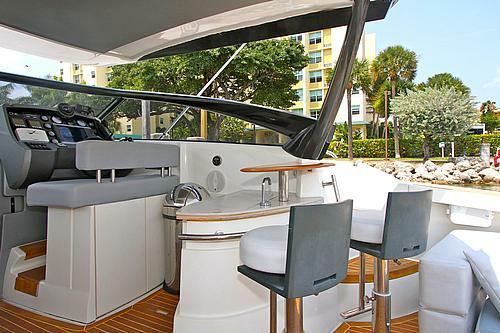 The 43 Baia has a fully equipped galley with stove, refrigerator/freezer, microwave, oven and coffee maker. She has a great entertainment system, with speakers throughout. 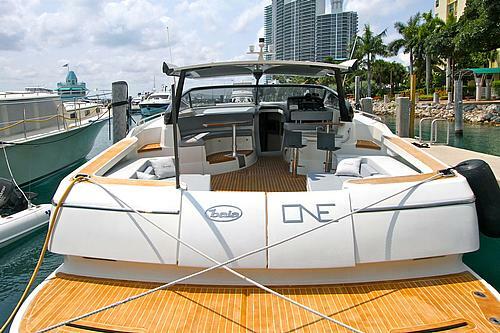 This yacht comfortably accommodates 2 guests for a boat charter in Miami on an overnight experience. Charters are available for Half Day (4 Hours), Full Day (8 hours) or Multi day. You’ll have a captain and stewardess catering to your every whim. Water, Soda, Ice and Fuel for local Miami cruising are included. 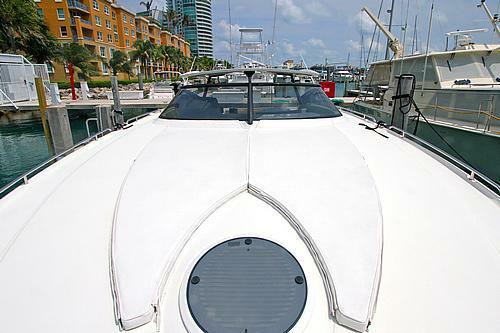 All charters begin at Miami Beach Marina, Sea Isles Marina or Fontainebleau Marina. We’ll work with you to create the perfect itinerary based on your needs. Cruising hot spots include: Star Island, Palm Island and Hibiscus Island were you can have a sneak peek of celebrity homes and top Miami Beach Real Estate. Then cruise down to Nixon’s Sandbar in Key Biscayne, where you can anchor and swim. As evening approaches and it’s time to head back; we finish your charter cruising by downtown Miami and watching the sunset over our beautiful skyline as the city lights come alive. Multi-day charters are available to the Florida Keys, Bimini, Nassau and The Bahamas. Contact us now and we’ll custom tailor an exclusive itinerary just for you. Are You Human? Enter the Code to Prove It.